Steel prylever bar also know as crowbar, lifting pinch bar, roller bars, heavy duty steel pry bar lever, and so on. Steel prylever bar capacity is 3.0 tons and 5.0 tons, more capacity can be customized as demand. Steel prylever bar constructed with special nose plate is safety to lift loads. Crowbar applied on lift heavy duty loads safety and easily. Crowbar can be steel material, chromeplated, and other material as the applications. 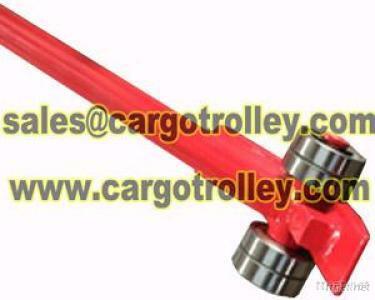 Crowbar with steel casters and bearings roller, long handle help move heavy duty loads with less strain on user. Lifting pinch bar helps to push lifting plate under the product to be lifted. Lifting pinch bar provides dock workers, riggers, and freight handlers with the leverage to get underneath heavy loads for lifting with fork truck, hand truck or other types of trucks. Heavy duty steel pry bar lever applied on moving and handling heavy duty equipment with less strain. Regarding steel prylever bar price list, crowbar applications, lifting pinch bar parameters, roller bars pictures, please kindly feel free contact with us. Professionally service hope will get your satisfaction.